The NewsLine: What Is Blushing? 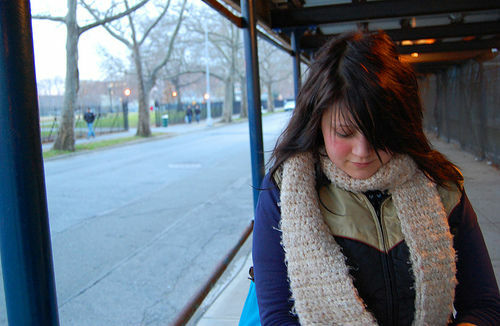 A girl looking downwards as she blushes. despite a close physiological relation, from flushing, which is more intensive and extends over more of the body, and seldom has a mental source. If redness persists for abnormal amounts of time after blushing, then it may be considered an early sign of rosacea. A medical condition known as Idiopathic craniofacial erythema exists, in which the sufferer blushes strongly with little or no provocation. This is related to social phobia. Erythrophobia, from Greek: ερυθρός, red, and Greek: φοβία, fear, literally "fear of redness", refers to pathological blushing. Arteries, capillaries, and veins that serve mainly nutrition needs. The subcutaneous venous plexus that plays a major role in the conduction of heat, and contains a major fraction of the cutaneous blood volume. Blood flow in the cutaneous resistance vessels and the subcutaneous venous plexus are both neurally and locally regulated. However, there are some important differences. One is, that cutaneous resistance vessels exhibit a basal tone independently of innervation in reaction to passive stretch induced by blood pressure (Rowell. 1974). This intrinsic basal tone is normally absent in cutaneous capacitance vessels . Along with this basal tone, all resistance vessels in the skin receive a tonic outflow from sympathetic vasoconstrictor fibers. This tonic outflow is inversely associated with body temperature. Vasodilation therefore occurs passively in resistance vessels the (alpha-adrenergic) vasoconstrictor tone decreases. Furthermore, an active neurogenic vasodilation must be assumed in the human skin. However, it is not clear if this vasodilation is mediated by specific vasodilator nerve fibers or if neuro-humoral effects are involved that are associated with the sympathetic cholinergic activation of sweat glands (Rowell. 1993; Lembeck & Holzbauer. 1988). Although some experiments lead to the conclusion that sympathetic outflow is involved in facial vasodilation (Drummond & Lance. 1987), 40 years of research have not clarified the mechanism behind active vasodilation. Cutaneous veins also are richly innervated with sympathetic vasoconstrictor fibers. The effect of activation of the outflow of these fibers is reduced by local cooling. In addition, cutaneous veins are temporarily reactive to various other stimuli. Each of the following can cause remarkably intense venoconstriction without obvious value to the organism: emotional stimuli (e.g. startle, apprehension, discomfort), hyperventilation, deep inspiration, and the Valsalva maneuver (Rowell. 1974). In resistance vessels, increased pressure mainly increases flow per time unit. In the cutaneous venous plexus with its generally slow flow rate, pressure mainly influences volume. Because of its enormous volume variability and its large potential capacity the venous plexus is believed to determine skin color (Rowell. 1993; Mellander, Andersson, Afzelius, & Hellstrand. 1982; Rowell. 1974). Since pronounced blushing is also characterized by a deep reddening of the skin, vasodilation of the venous plexus is probably the physical mechanism underlying it. Emotional blushing is only visible or apparent in a specific area called the blush region. The area is restricted to the face, ears, neck, and in some rare cases the upper body. Two main hypotheses to explain this regional restriction have been proposed. One is that vasodilation takes place throughout the entire skin of the body but is only visible in the blush region due to special anatomical structure of that region. The second is that a specific form of vasodilation takes place exclusively in the blush region. It is likely, that a combination of these two factors accounts for blushing. There is evidence that the blushing region is anatomically different in structure. The facial skin, for example, has more capillary loops per unit area and generally more vessels per unit volume than other skin areas. In addition, blood vessels of the cheek are wider in diameter, are nearer the surface, and visibility is less diminished by tissue fluid. These specific characteristics of the architecture of the facial vessels led Wilkin in an overview of possible causes of facial flushing to the following conclusion: "[...] increased capacity and greater visibility can account for the limited distribution of flushing". Evidence for special vasodilation mechanisms was reported by Mellander and his colleagues (Mellander, Andersson, Afzelius, & Hellstrand. 1982). They studied buccal segments of the human facial veins in vitro. 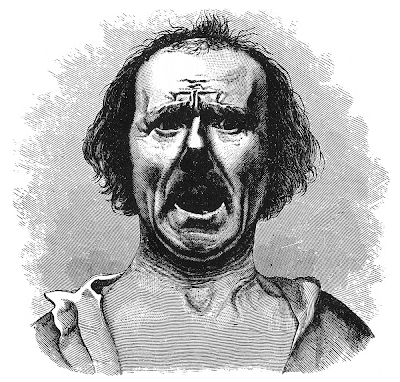 Unlike veins from other areas of the skin, facial veins responded with an active myogenic contraction to passive stretch and were therefore able to develop an intrinsic basal tone. Additionally Mellander et al. showed that the veins in this specific area were also supplied with beta-adrenoceptors in addition to the common alpha-adrenoceptors. These beta-adrenoceptors could exert a dilator mechanism on the above-described basal tone of the facial cutaneous venous plexus. Mellander and his colleagues propose that this mechanism is involved in emotional blushing. Drummond has partially confirmed this effect by pharmacological blocking experiments (Drummond. 1997). In a number of trials, he blocked both alpha-adrenergic receptors (with phentolamine) and beta-adrenergic receptors (with propranolol introduced transcutaneously by iontophoresis). Blushing was measured at the forehead using a dual channel laser Doppler flowmeter. Subjects were undergraduate students divided into frequent and infrequent blushers according to self-report. Their mean age was 22.9 years, which is especially favorable for assessing blushing, since young subjects are more likely to blush and blush more intensively. The subjects underwent several procedures, one of which was designed to produce blushing. Alpha-adrenergic blockade with phentolamine had no influence on the amount of blushing in frequent or in infrequent blushers, indicating that release of sympathetic vasoconstrictor tone does not substantially influence blushing. This result was expected since vasoconstrictor tone in the facial area is known to be generally low (van der Meer. 1985). Beta-adrenergic blockade with propranolol on the other hand decreased blushing in both frequent and infrequent blushers. However, despite complete blockade, blood flow still increased substantially during the embarrassment and blushing inducing procedure. Additional vasodilator mechanisms must therefore be involved. Charles Darwin devoted Chapter 13 of his 1872 The Expression of the Emotions in Man and Animals to complex emotional states including self-attention, shame, shyness, modesty and blushing. He described blushing as ".. the most peculiar and most human of all expressions." Possible psychological and psycho-physiological mechanisms for blushing have recently been reviewed by Crozier (2010). It has also been suggested that blushing and flushing are the visible manifestations of the physiological rebound of the basic instinctual fight/flight mechanism, when physical action is not possible.